What is the common thread that runs through materialistic, secular ideologies and religious and mystical beliefs? It is the belief in a Messianic Age. Indeed, the more on the "fringe" one is in the secular world - such as the dogmatic allegiance to Communism - the closer one actually is to an obsession with messianism. Ironically, the Jewish mystical approach to the coming of Mashiach, notwithstanding its characterization as an article of faith, can be approached and viewed from a logical vantage point as well. What is the basis for secular messianism? Inherent in the mindset of some secular philosophies is the notion that humankind is constantly evolving and that we will eventually graduate into a state that will transcend the egocentric nature of Homosapiens. When this occurs, a state of utopia will follow. Whatever the merits for evolutionary theory in the geological and biological arenas, there is certainly no scientific basis to support evolution as it relates to moral attitudes. If anything, events such as the Holocaust, which occurred in the twentieth century, militate against such an evolutionary philosophy. Yet, despite the absence of scientific and logical support, there are millions of people who have accepted secular messianic beliefs without reservation. Some schools of psychology will also argue in favor of a messianic belief from its frame of reference. While psychology cannot discuss whether a utopia is possible, it does recognize that when we believe that things will get better, it gives us the ability to cope with life's difficulties. We have to have a belief in a "hereafter" of some kind, in order to make the "here and now" meaningful and worth living. What is it then about the Jewish version of messianism that some find difficult to swallow? Could it be Judaism's affirmation that a human Messiah will usher in this New Age that has irked some? This would hardly seem to be a problem in light of the fact that throughout history, single individuals inaugurated most, if not all, major movements for good or evil. Is not history replete with leaders who have irrevocably changed its course? To believe that once again a great leader will ignite within us the divine spark that will inspire and challenge all of us to change the world is not unsettling at all. What some find radical and disconcerting about Jewish messianism, however, is the suddenness with which the world will change. The image conjured up by many believers is one of a mythical, supernatural leader waving the proverbial magic wand that will instantaneously transform our universe, eliminate all vestiges of evil and create a utopian paradise. This image not only strains credulity, it also appears to insult our very humanity. After all, we are not robots or automatons. We do not change by a mere flick of a switch. If we did, we would not be who we truly are. And whatever good came would not relate to us. Indeed, according to Jewish theology, goodness that is not associated with human endeavor is not good in the most precise sense of the word. What good is there in a messianic belief system that speaks of instant, supernatural change? From the perspective of Kabbalah and Chassidic thought, messianism is, in fact, the very opposite of sudden transformation. It is a process that has taken as many years as humans have inhabited this planet to effect radical changes in the world. Humankind's collective efforts over the course of centuries and millennia have paved the way for a New Age. These changes occur through the observance of good deeds that are referred to in the Jewish lexicon as a mitzvah, G-d's Divine prescription for a good life. Whenever we perform an act of kindness, for example, it leaves an indelible imprint on the world. In their aggregate, these acts have the capacity to utterly transform the world. If there is a sense of mystery, it is not nearly as much about the Messianic Era as it should be about the nature of a solitary act of kindness. When we reflect on the power of a divinely ordained mode of behavior, it will become clear that there is more energy contained in this act than in any other phenomenon, natural or man-made. This can be demonstrated from several vantage points. First, the word mitzvah (which we usually translate as commandment or good deed) actually contains another nuance - connection. By performing a mitzvah we create a connection between G-d who is infinite and ourselves who are finite. There can be no greater revolution than bridging that which is unbridgeable. Judaism believes that every time one does a mitzvah, one transforms an intrinsically finite experience into an infinitely divine experience. Second, the Talmud states and Maimonides affirms that a solitary mitzvah is endowed with the power to alter the balance of the entire universe. If we were to unleash all the fury of all our nuclear arsenals, we could not effect a change as profound and as cosmic as the performance of one solitary act of kindness. In this light, we can hardly imagine the cataclysmic results of all the times people have performed acts of kindness since the beginning of time, particularly those who have lived since G-d revealed Himself at Sinai with the giving of the Ten Commandments. To be sure, people have also acted cruelly and unleashed untold evil. But, as the masters of Kabbalah have affirmed, evil, by its very nature, does not enjoy the same longevity as the forces of goodness. With the passage of time, the evil of yesterday has already been dissipated, whereas the positive energies endure forever. From this perspective, the question we should be asking ourselves is, How is it, in light of all the unleashing of positive energy, that the world still appears to be the same? For one who cannot comprehend the possibility of the world changing instantly and who would deem the eventuality of this occurring to be utterly irrational, let him/her reflect on the real enigma instead. How is it that the thousands of years of goodness that the world has experienced have not made the world look drastically different? If there is something irrational about Mashiach, it is not how can we imagine his coming so suddenly, but the reverse. Why hasn't it happened already? Why has the world that has been bombarded with so much positive energy not yet exhibited the changes associated with the messianic utopia? Jewish messianism is thus the final resolution to the enigma of good not carrying its weight. It is no wonder that Maimonides, the great rationalist, considered the belief in the coming of the Messiah to be one of the principles of Judaism. Despite Maimonides' attempts at reconciling Jewish beliefs with rational thought, he did not feel compelled to reconcile Mashiach with logic. Belief in a messianic outcome is the corollary of all the other theological foundations of Judaism. Once one believes in G-d and His system of cause-and-effect (that good actions leave a positive imprint on the person and the world), it is logically imperative that the world will change. If the Messianic Age takes us by surprise, it will certainly not be because of some waving of a magic wand. Rather, it is because we are so accustomed to a world that does not follow the rules of logic and our inability to sense the transformations that have been occurring since the beginning of time. The recent collapse of the Soviet Union can serve as an illustration. Outwardly, it appeared as if there was a virtual instant transformation. In truth, the seeds for the demise of the Soviet system had been sown years and decades earlier. While even experts were taken by surprise, we can now all look back and analyze the dynamics of the collapse that have been in motion since the very birth of communism. Similarly, despite the way the onset of the Messianic Age will take us by surprise, we will all be able to look back at the myriad actions that were chipping away, from underneath, at the very roots of evil. 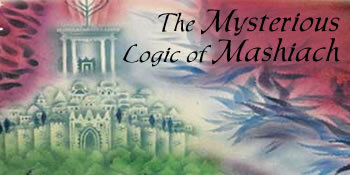 Judaism's view of the Messianic Age, then, is that it is not some fairy tale or a psychological crutch. It is the most rational consequence of centuries and millennia of human efforts that will finally bear their fruit.